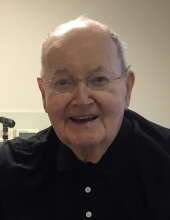 Paul Carlson Ramsay, age 92, passed away on March 30, 2019 surrounded by the comfort of his loving family at Norwood Hospital. He was the son of the late Frank and Florence (Carlson) Ramsay. Paul was born on December 26, 1926 in Belmont and was a graduate of Belmont High School. He proudly served his country in the US Army during WWII. He married his wife Marilyn (Ray) on September 1, 1966 in Boston. He was the owner and operator of his own business for over 40 years in Norwood updating auto interiors for the many dealerships on the Automile. Paul was an avid golfer and loved aviation and boating. He was a New England Patriots and Red Sox fan and enjoyed attending his grandchildren’s sporting events. He was also a history buff. Paul was a loving and devoted husband, father and grandfather. He most enjoyed spending time with his family. Loving husband of Marilyn (Ray) Ramsay. Devoted father of Kevin P. Ramsay of Pawtucket and Lynne R Sylvestre and her husband Dennis of Foxborough. Beloved grandfather of Jacob, Jackson and Morgan Sylvestre. Relatives and friends are kindly invited to attend calling hours on Saturday, April 6 from 1 PM to 3 PM at the Roberts and Sons Funeral Home, 30 South Street, Foxborough. A memorial service will be held at 3 PM immediately following calling hours. For additional information please contact 508 543-5471. To send an on-line condolence please visit the funeral home web site at www.robertsdandsonsfuneralhome.com. In lieu of flowers, donations in Paul’s memory may be made to the Foxborough Veteran’s Services, 40 South street, Foxborough, MA 02035. "Email Address" would like to share the life celebration of Paul Carlson Ramsay. Click on the "link" to go to share a favorite memory or leave a condolence message for the family.